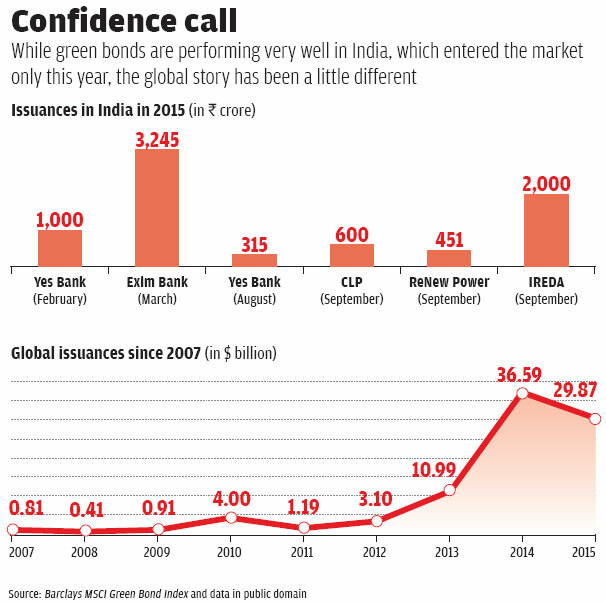 India has finally entered the green bond market, but at a time when the bonds are not doing well globally. Have we missed the bus? India has recently started dabbling in green bonds, a financial instrument to generate funds for climate-friendly investments. 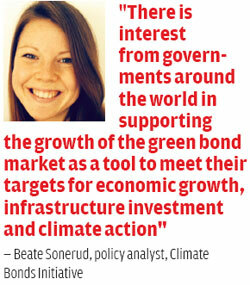 Launched for the first time by the European Investment Bank in 2007, green bonds were a rage globally till 2014. In fact, that year bonds worth $36 billion were sold, which was three times the figure for 2013. However, in 2015 the size of the market has shrunk. According to Climate Bonds Initiative, an international non-profit focused on mobilising the bond market towards climate change solutions, there has been a total issuance of only $29.87 billion so far this year. This assumes significance in the context of the Paris climate meet to be held in December. India plans an unprecedented scaling up of its renewable energy generation capacity to 175 GW by 2022 from around 38 GW now. According to an estimate by the Union Ministry of New and Renewable Energy, this would require a capital investment of $120 billion and equity of $40 billion. The Herculean task of financing these green projects also offers an opportunity for introducing new mechanisms such as green bonds. September saw ample activity in the green bond market (see ‘Confidence call’). CLP Wind Farms (India), the largest wind power developer in the country, raised R600 crore through its first green bond issue. This was the first such bond issued by a non-bank corporate in India. ReNew Power Ventures was another company to issue its first project-specific, credit-enhanced green bond in the country in September. Credit enhancement means guarantee in the form of financial support to cover losses in an adverse situation. It enhances the overall credit rating of a green bond. Banks started issuing green bonds even before corporate India did. In February this year, the country witnessed the first green infrastructure bond issuance by Yes Bank, followed by the Export-Import Bank of India, which launched the first dollar-denominated bond offering out of India. The issue was oversubscribed 3.2 times, reflecting the huge demand for the instrument. World Bank’s private investment arm, International Finance Corporation (IFC), also raised RS 3.15 billion in August through a green Masala bond for private sector investments that address climate change in India. A Masala bond is a rupee-denominated instrument issued in offshore capital markets. The bonds are called Masala referring to the Indian subcontinent which is known for its spicy cuisine. The bond market is famous for such colourful names. For instance, green bonds issued in Lira for Turkish markets are called “Baklava” with reference to the country’s famous pastry. IFC says it would invest all the proceeds in a green bond issued by Yes Bank which, in turn, will invest in energy efficiency projects, mainly in the solar and wind sectors. 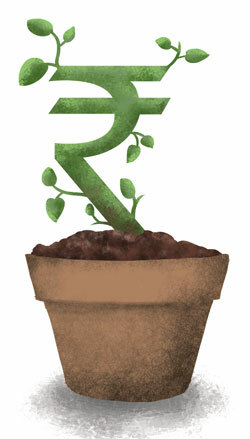 Although the market for green bonds is still nascent in India, investor appetite has shown that it is here to stay. An industry expert says the market is likely to grow to Rs 10,000 crore in the next three years, from over Rs 7,600 crore in 2015. According to Ashootosh Sharma, director, Equis Funds Group, one of Asia’s largest energy and infrastructure investors, green bonds make it cheaper to raise money to fund environment-friendly projects. Multi-lateral financial institutions which are mandated to invest in climate-suitable projects provide a firm investor base for such instruments for both subscription and credit enhancement. 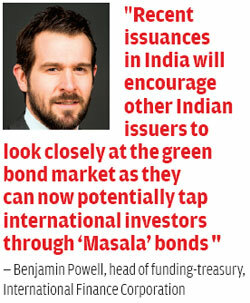 IFC’s head of funding-treasury, Benjamin Powell, says recent issuances in India will encourage other Indian issuers to look closely at the green bond market. The issuers can also tap international investors through Masala bonds, he adds. However, there are a few green bonds that are more attractive. Rustagi gives the example of bonds issued by the Indian Renewable Energy Development Agency and the Power Finance Corporation, which offer tax benefit to investors. He says the bonds which do not offer any tax incentives are nothing more than marketing gimmicks. Countering his view, a banker, who deals with green bonds and spoke on condition of anonymity, said that though green bonds are the same as regular bonds in terms of return and other characteristics, there are certain restrictions. “Proceeds from the issuance of a green bond can only finance green projects. Also, there are certain international guidelines laid down by the World Bank as to where the proceeds can be utilised. These are also monitored by third parties, for example KPMG, Ernst & Young and PwC,” said the banker. He added that there is a huge amount of money—for instance, pension schemes—earmarked by countries and international organisations which is to be invested in environment-friendly projects. At the UN Climate Summit held in New York in September 2014, institutional investors representing $43 trillion of assets expressed willingness to invest in such projects. Though the Indian green bond market is bustling, their performance in most other countries has been lacklustre this year. Experts say issuances are likely to pick up in the run up to the climate summit in Paris scheduled to be held later this year because the event offers issuers an opportunity to market their green projects and assets. Absence of US corporate issuers in the green bond market this year and the late entry by China have also added to the slump in the global market. China, which is likely to hit the market around Christmas, is expected to be a big player. As far as global predictions are concerned, Climate Bonds Initiative and Swedish Bank expect 2015 issuance to reach $70 billion.